Warning, this is not for the faint of heart. Walking into an average beef tartare eatery in Korea, you will see the word “liver” on the menu board. Here, the word refers to cow’s liver -- served raw. The raw, chopped liver has a dark red hue. Though some may think fresh liver should have a scarlet or bright red shade, the dark red is a sign of freshness. The surface gleams with moisture, so much so it is almost reflective. It is hard to pick up a piece of the liver using chopsticks, given its fluid texture. Taking a bite, the texture is gelatinous, especially like Jell-O. It is soft yet firm. Contrary to the expectation of the anxious first timers, there does not seem to be a distinctive taste or odor. What is striking is the coolness of the liver and the soft texture. However, after more than three chewings, one can fully experience the unique taste and smell. It is similar to cooked pig liver, a popular street food in Korea. The mouthfeel, however, is very different. While cooked pig liver is dry enough to make one go grabbing for water after a few bites, raw cow liver is full of moisture. The liver melts in the mouth with the slightest of pressure. Be warned, while the texture may be pleasant, the smell and taste of blood fills the mouth. Even after swallowing, the sensation lingers. Gulping down a glass of water to wash down the unpleasantness, the feeling only amplifies. Omasum, referring to the third compartment of the stomach in ruminants, is often served with raw liver. Once again, it is anything but inviting, with an appearance akin to a dirty rag, a mix of gray and white, speckled with tiny bumps. The taste, however, is an unexpected twist -- it is fresh and clean. The meat contains not much smell or taste; it is just chewy. 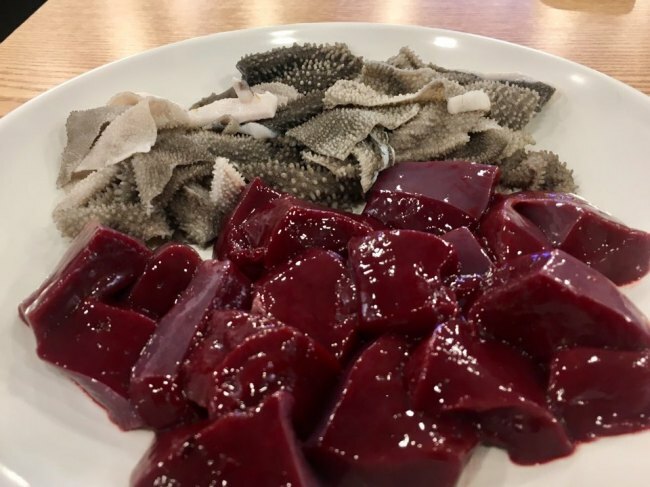 It is similar to eating the prized fin part of sashimi. To enhance the mild flavor, it is best dipped in sesame oil sprinkled with salt.